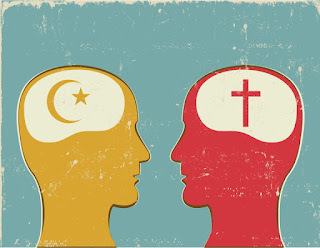 While Islam refers to Christians as "people of the book" along with Jews and Zoroastrians (as opposed to polytheists and animists), it denies that Christianity is the final and permanent revelation of God and speaks quite negatively of Christians as "the infidels" (kaffur). This is because Muhammad, "the seal of the prophets," is the last and greatest of the prophets of Allah (Qur'an 48:27-28). He alone corrects the errors of the past, including the aberrations of Christianity. Islam abrogates Christianity (Qur'an 48:27-28); it is Christianity's replacement. The argument for abrogation is rooted in five major claims made by Islam against Christianity. This is a significant apologetic challenge that Christians today need to face intelligently, given the global reach of Islam and its growing influence in the West. Claim 2: Jesus was not crucified. The Qur'an states that Jesus (Issa or Isa) was not crucified. While Chawkat Moucarry points out the difficulties in understanding this text in the original Arabic, this text has been taken by Muslims worldwide to mean that Jesus was not crucified but was delivered somehow how by Allah. To the Islamic mind, it is unthinkable that a true prophet should be subject to such humiliation. Thus, if Jesus was a prophet, he must not have been crucified. However, another verse from the Qur'an claims that Jesus would be killed (Qur'an 3:54-55). Most Muslims interpret pret this to mean that Jesus will die after he returns from heaven some time in the future. But when he was on earth the first time, he was taken directly back to Allah. A quick glance at the Gospels and the rest of the New Testament indicates that the death of Jesus on the cross is the ineradicable center of the Christian message. ... the Hebrew Scriptures prophesy Jesus' death (Isaiah 53). Jesus himself spoke of his impending death with his disciples (Matthew 12:39-40; John 10:11), his death on the cross is recorded in all four Gospels, and it is either assumed or expressed in every New Testament book. These are the most ancient and reliable documents available about Jesus of Nazareth. In Paul's summary of the gospel, Jesus' death is foundational: "For what I received I passed on to you as of first importance: that Christ died for our sins according to the Scriptures, that he was buried, that he was raised on the third day according to the Scriptures" (1 Corinthians 15:3-4). Moreover, contemporary historians agree that Jesus was executed through crucifixion. Even the archliberal New Testament scholar Rudolf Bultmann believed this. For over six centuries before Muhammad, Christians (and Jews) believed that Jesus had died on a cross. While secular historians may reject the biblical meaning of Jesus' death as atoning for human sin, they do not question the factuality of his death by crucifixion. Therefore, any claim to the contrary bears the burden of proof to refute the universal claim of the Christian church and the testimony of the vast majority of ancient historians.